You can tell the rodeo is coming up soon. My town's rodeo is the biggest in Far North Queensland, and one of the most famous in Australia. The bullriders who come to our rodeo are the best in Australia. At the moment, all the caravans are trickling in and all the parks are full of them. The cowboys and station workers have descended on the town; the pubs are full of them, the shops are full of them and you can't move for the smell of dirt and smoke. Our town is not a big one, but every July, everybody comes out of the woodwork for the rodeo. The procession, where the Rodeo Queen is elected, is next Friday. Next Saturday, my brother's birthday, is the actual rodeo. His birthday always falls on or near rodeo weekend. Everyone gets a day off work on Friday and town explodes with people; it's this time of the year you realise just what nationalities make up the town. My family was always heavily involved in the rodeo. In fact, my great grandma was one of the women who set up the whole 'Rodeo Queen' thing. Essentially, a bunch of girls prove they can rope bulls, ride horses, and dance (both square dances and formal dances) and then they dress up and ride on the back of a truck through the procession throwing out candy (the crowd always likes the princess whose candy can last the two circuits of the procession). Then one of those Rodeo Princesses becomes the Rodeo Queen. And she gets to spend the weekend wearing cute little costumes and a sash and dancing around at the rodeo. Needless to say, not my idea of a good time. People staring at me while I wave and smile and attempt to look pretty (this means taming my hair, so no thanks). Sounds like a nightmare. But every year I go and watch all the princesses and try to get the best candy. It's weird because this year, I don't know many of the girls who are in the parade. I usually do, but not this year. I guess I've been away too long now. So, this chocolate cake always makes an appearance at rodeo time. This was the cake Mum always made for me and my brother on our birthday's. 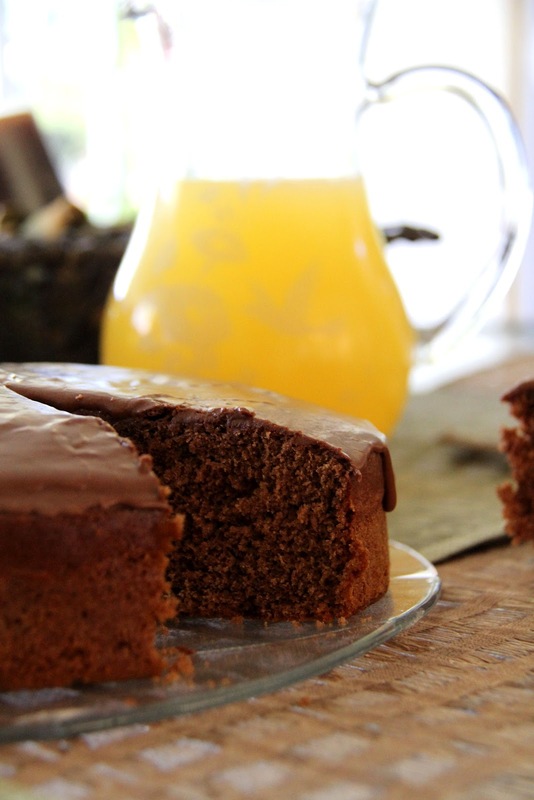 Therefore, every rodeo weekend we would have some of this cake with freshly squeezed orange juice (from our trees). So I decided now would be a great time to make and share it with you. 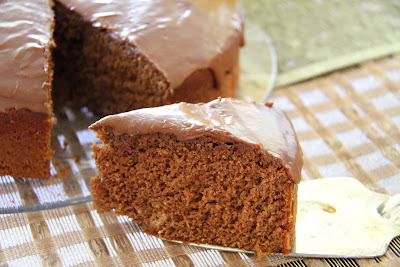 This cake is unlike most of the chocolate desserts I usually eat and make. It is very light and fluffy, and practically falls apart when you take it out of the oven. It is not rich, not decadent, but sweet and sugary. I find it more difficult to eat because I feel like I can taste the sugar - I prefer darker desserts. However if you like milk chocolate and lighter chocolate desserts, this is for you. The icing is definitely icing and not ganache. It is thin, a little watery and very easy to spread over the top of the cake. It does not stick like ganache, so you can't cover the entire cake with it. However, it is absolutely perfect with this cake. It is very sweet, but it perfectly matches the fluffy cake. Be warned, this is not healthy. 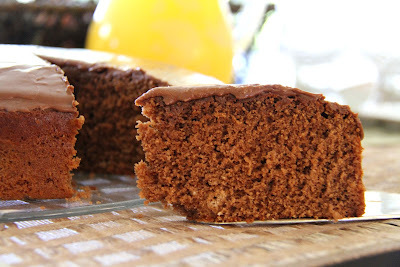 But if you are looking for a simple cake to make - not a three-tierd, multiple ingredient cake which requires several tins and hours of baking time - you want this. It is simple, practically one bowl, and it never fails to please. After all, who doesn't like something that is simply chocolate? This is my Mum's recipe - in her recipe book it is titled 'Bev's Chocolate Cake'. So I guess the credit really here goes to Bev. Thanks Bev. Main Ingredients: cocoa powder – for both the icing and cake. Occasion: Dessert or a snack. 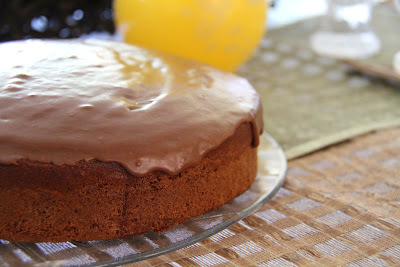 It does make a very easy birthday cake if you are looking for something simple and delectable. 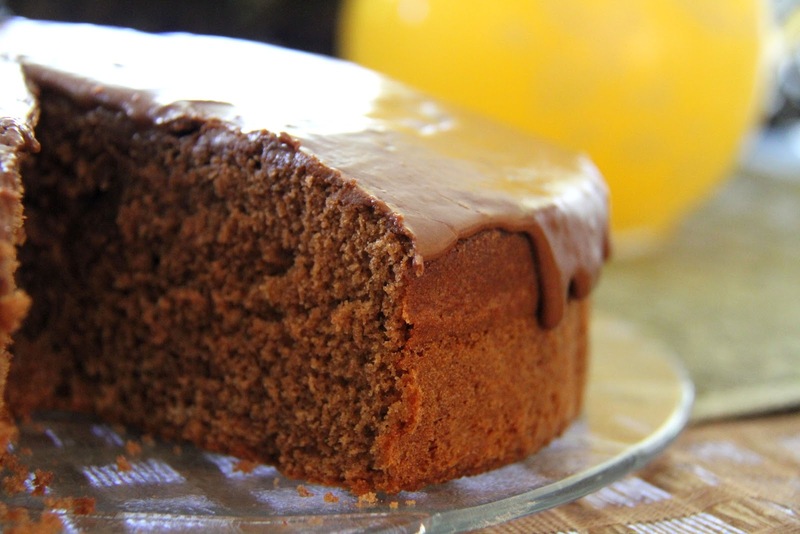 Menu Options: You can make this a darker, richer cake if you want. Simply add chocolate instead of cocoa powder or add chocolate chips for a darker kick. I would recommend serving this cake with milk or fresh orange juice. I know it is a very American thing to do to serve cake with milk, but here, our freshly squeezed orange juice is the perfect match for this cake. Makes 16 slices – this is how I cut it. You can obviously cut it more or less.These are kind of small slices, but it does lower the calorie count if you are worried about that. 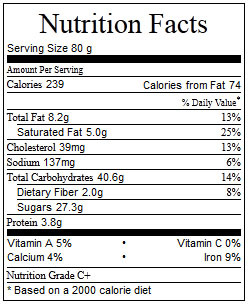 However it remains a very high sugar dessert. Preheat an oven to 180 degrees Celsius. Grease and prep a large cake tin – the size is really up to you. The cake rises pretty well I have found, regardless of what tin I bake it in. Sift the dry ingredients into a large bowl. Mix well with a wooden spoon. Add the melted butter and milk. Using a handheld or stand mixer, mix the ingredients for approximately two minutes. The mixture should be a light chocolate colour, but a little floury. Add the two eggs at once. Using the mixer, mix the mixture again for two minutes. It should remain a light chocolate colour, but the mixture should have turned runny. It will not be a very thick or gloopy (for lack of a better word) mixture. It will be relatively runny for a cake. Pour the mixture into a large cake tin and bake for 25 – 30 minutes, or until a skewer inserted into the cake comes out clean. Be careful not to burn the edges of the cake. Leave cake to cool, out of tin. Once it has cooled completely, you can ice it. In a medium sized bowl, sift the icing sugar and cocoa together. Stir well with a spoon. Add the butter and milk and mix together with a handheld or stand mixer. Make sure the mixture is a thin, light brown mixture. If the mixture is still a little lumpy or dry, add more milk. If the mixture is too runny, add more icing sugar and cocoa. If you need more icing, or you want a thicker icing than what the pictures show, add more icing sugar and cocoa in equal amounts. Using a flat knife, spread the mixture of the top of the cake. Only spread of the top of the cake. When the icing has dried, serve the cake. I recommend serving it with custard – this is a real guilty pleasure of mine. The Rodeo sounds like such a great event. Your cake looks gorgeous! I must admit that chocolate cake is one of my go to desserts at restaurants and this looks yummy!